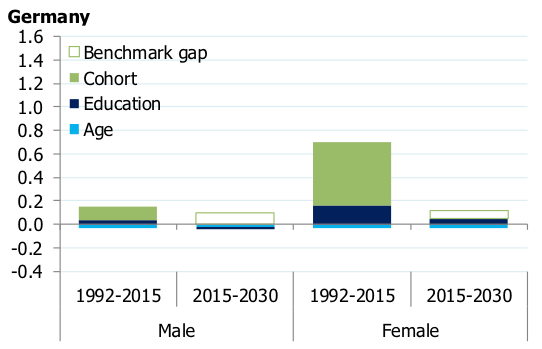 European labour force participation has increased over recent decades, fuelled in large part by increased female labour participation, improvements in education levels, and socioeconomic factors. This column explores whether this trend will continue, or whether we will see a decline similar to that in the US. Results indicate that while Europe’s labour participation is not on the verge of a reversal, targeted policies will need to take over from socio-educational developments in driving further growth. In recent years, European labour force participation has reached levels comparable to the US. On the one hand, female labour market participation shows a persistent increase since the 1980s. This was fuelled by the overall improvement in education levels – which are positively correlated with participation rates – and socioeconomic factors that increased the likelihood of new cohorts participating in the labour market, the latter being a distinctive feature relative to the US. At the same time, while male participation shows a secular decline in the US since the 1960s, a more resilient trend is found in Europe, thanks to rising participation among workers closest to retirement. 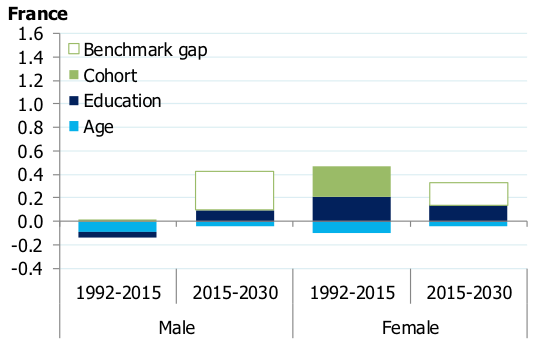 In the face of population ageing, labour force participation is increasingly critical for growth, as well as for public finances and the sustainability of pension systems. Accordingly, European policy efforts should concentrate on providing an adequate framework for increasing participation rates among those niches of workers where higher rates can be achieved. What's behind differential transatlantic trends? A historical comparison of labour force participation rates shows that the US and Europe shared an upward trend until to the mid-1990s, and thereafter began diverging.1 This reflects extremely complex underlying forces and behaviour that varies across countries and across individuals. the participation rate for each age-education pair (i.e. the 'pure cohort effect'). The decomposition is shown in Figure 1, including an additional disaggregation in the pure cohort effect between the population up to 54 years old and those closest to retirement age. Note: Shift-share decomposition for population between 25 and 64 years, considering changes in the structure by age and education level, and in the participation rate by age-education group (i.e. cohort effect). Source: authors’ own calculations from OECD data. The male participation gap between Europe and the US remained negative and relatively constant during the 1990s. Then it started to reduce and had closed by the time the Great Recession began, fuelled by more favourable demographics in Europe and a large negative 'pure cohort effect' among US males. Finally, the positive gap has continued increasing in recent years driven by the 55-64 year-old group and its higher likelihood of participation in Europe – a phenomenon likely related to (actual or expected) changes in retirement conditions. The participation gap was much more negative for females at the beginning of the sample, although current values are pretty similar to those of males. The convergence path has therefore been very intense, especially considering that it didn't really start until the late 1990s. 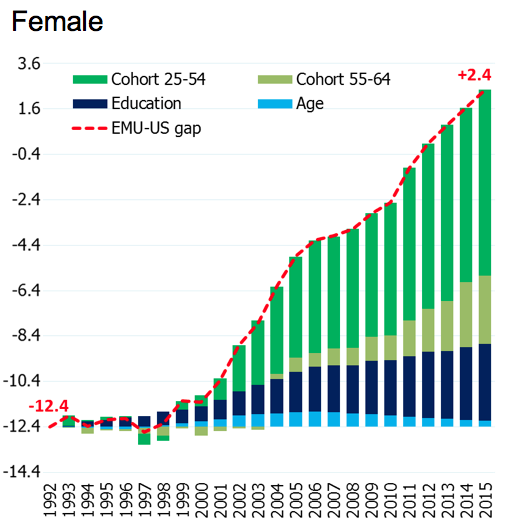 From then onwards, while the female participation rate slightly fell in the US, it increased by 10 percentage points for our European aggregate. This differential behaviour is predominantly explained by the 'pure cohort effect' (around three quarters of the overall gap change), while the rest corresponds to an improvement in education levels and a marginal role of demographics. The comparison between the US and Europe raises a critical question. Was this differential behaviour just a matter of convergence between the two areas? If so, are participation rates in Europe expected to follow the declining trends witnessed in the US? An answer is not straightforward given idiosyncratic factors, but we find some valuable hints when we turn to an individual-country perspective within Europe, given the strong heterogeneity across member states, particularly in the female segment. For instance, in the early 1990s Spanish women shared a very low participation rate with their Italian counterparts (below 50%, compared to over 60% in Germany or France), but the improvement in Italy since then has been around half what has been seen in Spain (16 percentage points versus 32 percentage points, respectively). At this point, with a forward-looking perspective, how do participation expectations compare across European countries? Figure 2 compares, for the four largest economies in our sample, how labour participation behaved in the last 25 years vis-a-vis our forecasts from 2015 up to 2030,5 based on demographics plus the gap relative to the highest-participation benchmarks.6 This figure allows us to assess to what extent demographics, both age an education, will weigh down on the potential gains from convergence. Age demographics are expected to move from a neutral to a slightly negative contribution as the ageing process accelerates, particularly in Southern Europe. The positive contribution of education demographics will soften once past improvements become established, and will hardly compensate for ageing. The pure cohort effect will rely less on convergence across countries due to strong and persistent increases in previous decades – Italy being a prominent example that still has very low participation figures, particularly in the female segment (and likewise for Greece). We conclude that even though participation in Europe doesn't seem destined to follow the declining path of the US, underlying forces are expected to change significantly over the next years, with decreasing momentum from past milestones in the socio-educational area, and an increasing need for policy action to drive further growth. 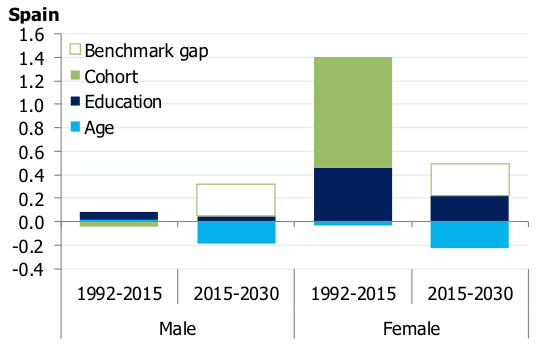 Notes: Benchmark corresponds to maximum value of participation rate for each gender in 2030 considering expected changes in age and education structures. Source: authors’ own calculations from OECD data and Eurostat population projections. The increasing labour force participation in Europe has been one of the most resilient growth factors over the last decades, as well as forming a critical pillar of fiscal and pension system sustainability. Given its relevance, a call for policy action is in order. However, contrary to past decades, where socio-educational gaps were evident in some countries, a ‘one size fits all’ approach would be ill-advised at this stage. The first goal of policy action should be to understand why participation rates remain low for certain gender-age-education groups. In particular, Figure 3 shows where these groups are likely to be more prevalent – amongst older workers, and amongst the prime-age female segment. Notes: Each lines correspond to a five-year width cohort. For the female population, potential drivers of persistent participation gaps range from idiosyncratic socio-cultural factors, through tax wedges and the availability of part-time jobs, to family and maternity support (Thévenon 2013). For older workers, such drivers include health conditions, pension entitlements, and life expectancy (OECD 2017). Balakrishnan, R, M Dao, J A Solé and J Zook (2015), “Recent US labor force dynamics: reversible or not?” IMF Working Paper No 15/76. Council of Economic Advisers (CEA) (2014), The labor force participation rate since 2007: causes and policy implications. ECB (2017), “Recent developments in euro area labour supply”, Economic Bulletin 6/2017. Fernández, C and D Martínez-Turégano (2018), “Labour market participation rate in the euro area: Performance and outlook, a long-term view”, Bank of Spain, Analytical Articles, Economic Bulletin 1/2018. Fujita, S (2014), “On the causes of declines in the labor force participation rate”, Federal Reserve Bank of Philadelphia, Research Rap Special Report 6. IMF (2017), “Labor force participation rates in advanced economies”, World Economic Outlook, October. OECD (2017), Preventing ageing unequally. Thévenon, O (2013), “Drivers of female labour force participation in the OECD”, OECD, Social, Employment and Migration Working Papers, No 145. See Balakrishnan et al. (2015), CEA (2014) and Fujita (2014) on drivers of labour force participation in the US. 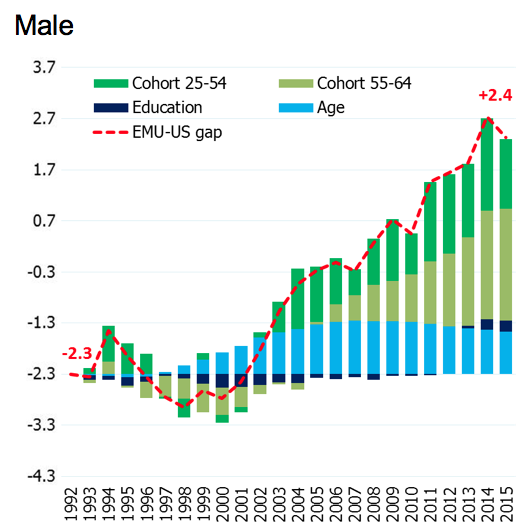 IMF (2017) and ECB (2017) underline the importance of dynamics in age and education structure for aggregate participation rates. Low corresponds to "Below upper secondary education" (levels 0 to 2 in the International Standard Classification of Education, ISCED), medium to "Upper secondary and post-secondary non-tertiary education" (ISCED levels 3-4) and high to "Tertiary education" (ISCED levels 5-8). A detailed shift-share analysis for each individual economic area is developed separately in Fernández and Martínez-Turégano (2018). Assumptions for these forecasts are explained in Fernández-Vidaurreta and Martínez-Turégano (2018). 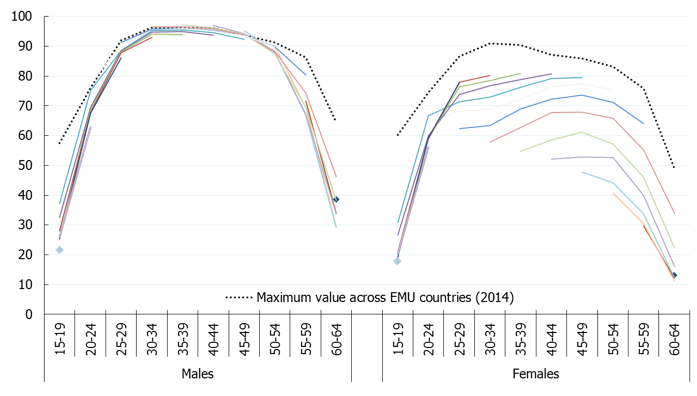 Highest-participation benchmarks correspond to the maximum value expected in 2030 across the eight countries in the sample, based only on demographic factors – i.e. changes in age and education structures. These specific benchmarks are 89% in the Netherlands for the male segment and 79% in Portugal for the female segment.